Pregnancy can be very demanding for your mare. Read further if you want to know how to support your mare during late pregnancy. A lot of time and effort is put into breeding, from choosing the stallion to patiently waiting eleven months for your bundle of joy to arrive! Providing optimum nutrition can play a big part in things running smoothly and gives your foal the best start in life whilst keeping your broodmare healthy. We normally consider late pregnancy to be the last 3 months before birth, and at this stage the foal is growing most rapidly, gaining 65% of its birth weight. Nutritionally supporting this quick growth is important and a balance between providing enough micronutrients to support the foal, whilst maintaining the mare’s weight is essential. To meet the increasing requirements for calories and protein swapping over to a specific stud feed such as Mare & Youngstock would be ideal. • Mare & Youngstock is fed at 500g/100kg of actual bodyweight per day, so for a 500kg horse this is 2.5kg per day to meet optimum vitamin and mineral levels. In the late stages of pregnancy, the foal is taking up an increasing amount of room, which means that the mares insides are getting a little cramped. This can lead to a decrease in appetite and feeding big meals can sometimes overface her; smaller, more frequent meals can make feeding more manageable. Maiden mares can be unpredictable and are sometimes more prone to losing weight following foaling so do keep a close eye on them and give our nutritional helpline a call on 0032 474 37 58 58 if you have any concerns. 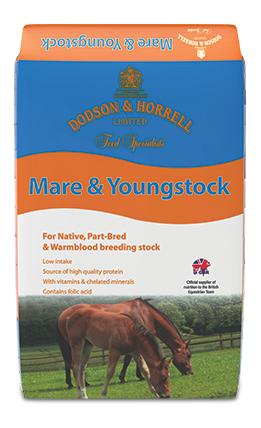 Mare & Youngstock also provides a calorie content suited to support the newly lactating mare, as they can produce up to 2-3% of their bodyweight a day in milk. Whilst we do want to provide calorific support during this time it is important to not let your mare become overweight as this can lead to a difficult foaling and put additional stress upon the joints. For those looking to provide additional support a traditional herbal supplement that can be added to the diet is Raspberry Leaves. Raspberry Leaves are believed to promote the health and normal function of the mare’s reproductive system in the last month of pregnancy. And finally, our last piece of advice would be enjoy it! Our nutritional team is always here to help, so do speak to the experts to help along the way and make yours and your mares experience the best it can be.